This documentary project has been in the works for some time now. 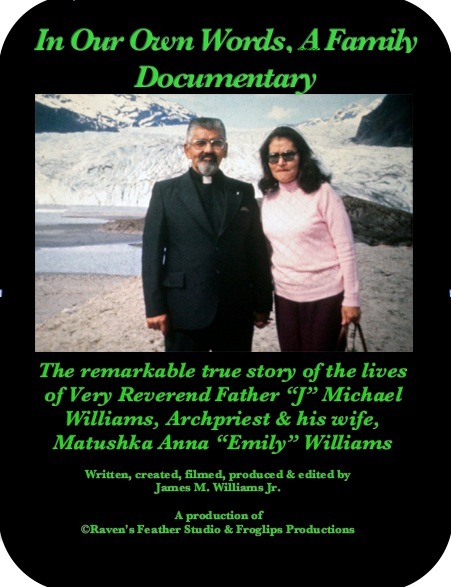 The entire premise of the storyline is based on the lives of my parents; Very Reverend Father "J" Michael Williams, Arch-Priest of the Russian Orthodox Church in America, Alaska Diocese, and his wife; Matushka Anna "Emily" Williams. The significance of this story is multifaceted. 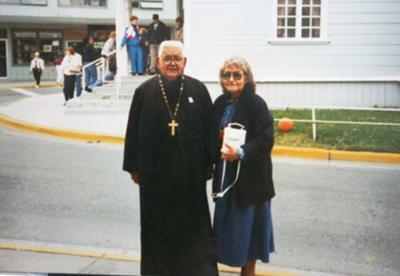 Father Michael is the first and the only man from the Tlingit Tribe of Southeast Alaska to ever become an ordained Priest in the Russian Orthodox Ministry. Matushka Emily was incredibly intelligent and a gifted artist. She was a Teacher, artist, but most of all, she was a Mother on many fronts. This story has numerous historic connections with Russian Orthodoxy which date back to when the Russian Orthodox Faith was first brought to Alaska over 200 years ago. Although there is nothing really significant about them to those who never knew who they really were, the story about their lives is truly remarkable. This documentary story will highlight their lives and follow the journey that will show who they really were. We will watch as they struggled through difficult and challenging times that would have stymied the most hardy among us. We will weep with them through numerous tragedies that would have crushed the average person. We will laugh, cry, be angry, but most of all, we will be amazed. For two unassuming people to have accomplished what they did is amazing. Hi everyone. Here's the new promotion poster for the documentary. Let me know what you think! Your parents were wonderful people and I was very lucky to share in their lives as many others were, what a wonderful way to honor them with a documentary, I look forward to it! Totally understand if you are not ready to divulge more details. We will wait with anticipation to see your documentary. Thanks again for sharing! Dear Desktop Documentaries.com, you inquired about more information regarding my documentary about my parents. you have my email address. please email me there and I will be happy to provide you with more information about my project. I will not post anything online insofar as the script and plot outline for the project. however I will gladly answer your quarries, but only with limited information. I hope you understand my personal need to protect my project. Sounds like a wonderful family documentary project and personal journey. Your parents seem like true saints! I would be curious for you to add specific details of what makes your parents amazing and how you plan to show that visually. Thanks for sharing your idea!